Our highly trained, professional therapists are committed to providing you a customized massage tailored to your specific needs. Jose Cordon is a husband, a father of two and head massage therapist at Next Level Fitness and Wellness Center in Irvine, California. Originally from Guatemala in Central America, he received formal training as a carpenter and graduated with a degree in private accounting. Upon arriving in the United States, Jose spent two years studying English and discovered his passion for massage therapy! He studied at Bryman College, during which he gained 800+ hours of hands-on experience. 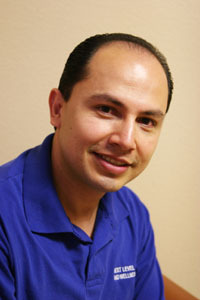 Jose continued expanding his knowledge base of innovative massaging techniques that Kneading Massage proudly offers. Bilingual in Spanish and English and with such a well-rounded massage skillset, Jose has a clear advantage over other professionals in the industry, and has garnered a loyal client base.